UPDATE: The Durham Board of Education voted Wednesday evening to close schools on May 16th to accommodate the more than 1,000 educators expected to take the day off to lobby the legislature for better pay. With close to 1,000 Durham teachers expected to take a “personal day” to rally May 16 in Raleigh, it seems likely that the school system will close schools that day. A News & Observer report Wednesday examines how other districts are prepping for a large-scale, teacher advocacy day, which is timed to coincide with North Carolina lawmakers’ return to session. Charlotte-Mecklenburg Schools expects to have a preliminary tally Friday of how many teachers are taking leave that day, said school board Chairwoman Mary McCray. Meanwhile, district leaders are trying to line up all available substitute teachers and drawing up plans to send top administrators in to teach classes. “I would be willing to go sub in a classroom myself if need be,” said McCray, a retired teacher and former president of the Charlotte-Mecklenburg Association of Educators. Even though Raleigh is in Wake County, which would make it close geographically for teachers to attend the march, Wake school officials say they’re not seeing large numbers of educators who are requesting the day off. Lisa Luten, a Wake schools spokeswoman, said they have enough substitute teachers at this point to cover for the day. Wake hasn’t had to call in top administrators to cover classes since 2015, when many teachers didn’t show up after the district cut into spring break to hold snow makeup days. Raleigh parent Stephanie Lormand urged interim Wake County Superintendent Del Burns on Tuesday to close school on May 16. She told Burns that he has nothing to lose. “Please close Wake County schools on May 16th to allow the largest school system in the state to advocate for public school funding at the state legislature,” Lormand said during Tuesday’s school board meeting. The Durham district has said nearly 1,000 teachers, or about 41 percent of its teaching corps, have requested personal leave May 16, with some schools reporting that nearly all will be absent. The school board will hold a special meeting Wednesday to decide whether to close schools. The march coincides with the opening of North Carolina’s General Assembly — and with the final month of school, when students are preparing for exams and many high schools are giving Advanced Placement tests. North Carolina’s teachers and administrators are walking a careful line. The “March for Students and Rally for Respect” is playing out in the context of recent #RedForEd teacher walkouts and strikes in Arizona, West Virginia and Kentucky. Sources ranging from The Brookings Institute to Washington Post education writer Valerie Strauss have flagged North Carolina as one of the next Republican-led states that’s ripe for a teacher strike. “The goal is never to strike or walk out. 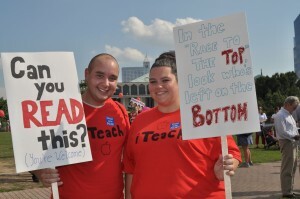 The goal is to change education policy,” NCAE President Mark Jewel said Tuesday. He cast the action as a march for students and a rally for better pay, safer schools and newer buildings. Erlene Lyde, president of the Charlotte-Mecklenburg Association of Educators, says her group had kept the call to action fairly low key, not wanting to prod principals into doing anything that might restrict participation. But after news of the widespread Durham participation broke, “I think it’s going to ramp up,” she said this week. The Charlotte-Mecklenburg group has one bus to Raleigh filled and a second started, she said. Jewell said that, as of Tuesday, roughly 1,000 people had registered to participate, but those numbers could climb — especially if Durham County alone actually sends hundreds. Administrators, meanwhile, are trying to support their teachers while avoiding massive disruption. And they don’t want to antagonize the GOP-led legislature that provides the majority of public school funding. McCray said she doesn’t consider closing schools this late in the year an option, but she wants to see teachers participate in the march. She says she has heard the state senate will release its budget plan on May 15. Depending on how public education fares, she said, the rally could be a thank-you or a protest.